President of the University of California Janet Napolitano speaks in Washington, D.C. 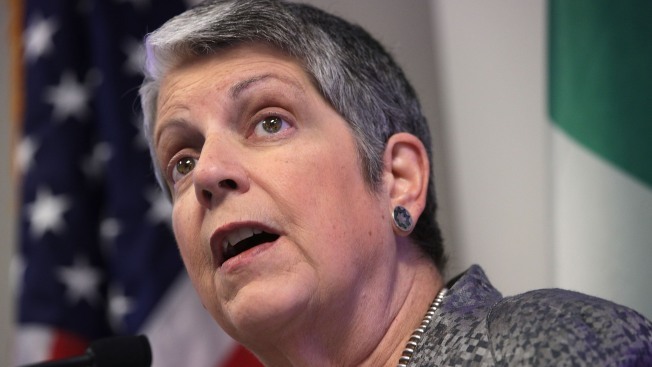 The University of California's governing board chastised UC President Janet Napolitano in a rare public rebuke Thursday and asked her to apologize for her office's interference in a state audit last year. Napolitano issued a prompt apology, which did little to quiet criticism that has erupted over her office's meddling in what was supposed to be a confidential state auditor's survey of UC campuses. "I exhibited poor judgment," said Napolitano, who has previously apologized and vowed to prevent any future interference in the work of the state auditor. "As I have said previously, I deeply regret this mistake and sincerely apologize." The regents' admonishment came after the board met for a five-hour, closed-door session to discuss an independent fact-finding report conducted by former state Supreme Court justice Carlos Moreno and a Southern California law firm, Hueston Hennigan. The investigation found that Napolitano's top aides had sought to suppress campus criticism of her office in surveys that were supposed to be confidential and sent directly to the state auditor. The investigators found that Napolitano approved of the plan to review the survey responses but said there is "insufficient evidence" to conclude that she knew the full range of what her staff was up to or that she directly approved of any interference, the board said in a statement. It added, however, that she is ultimately responsible for the conduct of her staff. Napolitano's actions "reflected poor judgment and set in motion a course of conduct that the Board of Regents finds unacceptable," board chairman George Keiffer said in a statement. Nonetheless, he said, the board "continues to have confidence in and fully supports her continuing leadership." As part of a 2016 review of finances at Napolitano's office, State Auditor Elaine Howle sent confidential surveys to each campus. She discarded the survey results after learning of the interference from Napolitano's office. Her highly critical audit found that the UC headquarters failed to disclose $175 million in reserve funds, paid its staff generously and had relied on weak budget practices. The fact-finding report cited evidence that the president's office chief of staff, Seth Grossman, and his deputy, Bernie Jones, directed the interference and oversaw changes to confidential survey responses from three campuses _ Santa Cruz, Irvine and San Diego. Their changes put Napolitano's office in a better light. Grossman and Jones resigned last week. Through spokesman Nathan Ballard, Grossman said UC's internal audit staff had recommended that the president's office review the survey responses and that UC's attorneys had approved it. Gov. Jerry Brown this year signed a bill prompted by the UC controversy that imposes a $5,000 fine if agencies interfere with a state audit. The measure takes effect Jan. 1. "This report is deeply disappointing to me," said Democratic Assemblyman Al Muratsuchi of the Los Angeles area, who helped develop the law. He said the actions of Napolitano's office "clearly undermine the Legislature's trust in the University of California leadership" and urged the Regents to hold her accountable. But he stopped short of calling for Napolitano to step down.